Primary data forms the life blood of any survey. The best of survey design and planning efforts finally come down to this. Any research is only as good as the data that drives it. Evolution of technology has given the researchers powerful tools and dramatically transformed the ways in which researchers interface with their subjects. In this article we will explore digital tools and IVR, the exciting new data collection methodologies, and weigh them against the traditional paper-based surveys. Despite the advent of technologically superior, and arguably more efficient alternatives, paper-based surveys remain an important tool for primary data collection. A questionnaire is administered to the subjects directly either via an instructive letter or by an interviewer who assists them in navigating through the survey. Low overhead cost: Paper based surveys have a low overhead cost and do not require the initial investment and effort associated with the other modern methodologies that we shall see later. Little or no training required: They come with a sense of familiarity, since people are used to dealing with paper based information. In demographics that are not very tech savvy, paper based methods may elicit the best response. Potentially higher reach: They have the potential to reach even the most remote interiors of the nation that suffer from poor power supply and communication connectivity. No technical glitches: Paper based methods, being manual in nature are less susceptible to technical glitches. Update: We changed our mind on this after the UNFPA ran out of pencils while carrying out the recent Census in Myanmar. Just a few days into the census, many regions ran out of pencils. They were being sharpened so furiously by newly-hired enumerators that UNFPA had to make an emergency international procurement of 170,000 pencils to keep things on track. Time consuming: Administering paper based surveys is a time consuming process. The time taken during the transfer of information from the point of collection to the hub of data assimilation and analysis is unavoidable in paper based surveys due the manual nature of the process. Data entry: Transferring information collected through paper based surveys to computers for digitization and analysis has room for erroneous entries through lapse of human attention. This is another drawback that can be addressed using the more technologically advanced alternatives. Retaining records: Record retention and recall can be a challenge. Maintaining all the response sheets used during the paper based surveys can mean a lot of unnecessary bulk. Sheets of paper can also suffer from wear and tear during transit and storage. Logistical difficulties: Surveys that are delivered by post and expect the respondents to post the completed survey through mail may never receive a response as most respondents have shown unwillingness to take that extra effort. Paper-based surveys can be a viable alternative to collect information about the impact of tribal welfare schemes, for instance, at the hinterlands of the sparsely populated states in North Eastern India. The lack of familiarity with digital tools among respondents and poor communication connectivity makes paper based surveys the most reliable option. The assumption of lack of familiarity with digital tools and poor communication connectivity would, happily, not hold up in most parts of our country today. Wireless infrastructure has grown tremendously and low cost mobile devices have shown extraordinary penetration even in the most unlikely of places. People all over the country, from all walks of life have benefitted immensely more this digital revolution. This has also made them more accessible to the researchers. Real-time data collection and analysis has never been easier. Opportunity for data analysis: Gathering data through digital tools makes life a lot simpler for the researchers. The data generated through a well-constructed questionnaire can be fed in for analysis directly without any need for further data sanitation. Digital communication: Digital communication makes it possible for researchers to connect with a vast population regardless of their location. Studies have also shown that digital tools generate a much higher response rate. Painless data entry: Data entry and assimilation is quick, information gets stacked and processed for use in real-time. Digital tools eliminate the need for manual intervention and minimize the chances of human error creeping in. Economies of scale: Despite the larger overheads required for initiating a digital survey, the magnitude of the survey’s reach means that the cost-per-response is significantly lower when compared to traditional alternatives. Flexibility to modify survey: Modifying the survey based on the real-time feedback is easy. Digital tools give you the flexibility to make these changes swiftly and push the survey back into the field without waiting for an entirely cycle of survey and analysis before making the call. Infrastructure limitations: Digital communication, the biggest advantage of this methodology, is also its most debilitating liability. Digital tools cannot be used to administer surveys directly in areas that do not have the adequate infrastructure. Sending interviewers with devices that store responses and relay them back to the processing hub when they find network connectivity may be a good work around. Unfamiliarity with digital tools: A complete reliance on digital tools that administer the surveys to the target population directly might miss out on responses from the sections that are not comfortable using these devices. Again, sending in interviewers with mobile devices will aid the process. The additional cost incurred in doing so may be justified by the significant improvement in the penetration and response rate. Use digital tools in areas with considerable presence of a reliable communication infrastructure. A general familiarity of digital devices among the target population will be an added advantage. Send in interviewers with mobile devices to aid the process wherever necessary. The benefits of real-time data collection and analysis, flexible survey design, increased response rate and minimized human error will more than compensate for any additional overheads incurred while using digital tools. Interactive Voice Response (IVR) refers to surveys that are administered using telephones. These questionnaires are relayed to the respondents directly and their responses are captured via the numbers dialled when prompted by a question. Potentially higher reach: As these surveys are driven by voice response, IVR systems have the potential to reach even the sections with poor literacy rates. Lower cost: Using IVR can drive down the cost significantly when the target population incidence is low and spread across a vast geography. Effective in engaging respondents unfamiliar with technology: IVR has also been found to be particularly effective in engaging the older demographic and are more suitable than digital tools for respondents who are not comfortable using such internet enabled devices. Requires in-depth research: IVR requires significant research for accurate and complete data collection; the survey needs to be thought out to the minutest of details. Dependence on external factors: The effectiveness of this approach can vary depending on the demography and complexity of the application; the survey must be designed for efficient delivery over telephone. Requires contact information: Having a database of the telephone contact information of the respondents is imperative for proceeding with this approach. Works best for short surveys only: Voice based techniques would work best only for short surveys; holding the attention of respondents over phone beyond a certain time limit will be difficult. IVR can be a viable alternative for short surveys such as customer engagement feedback, where the target population’s incidence is low, a large section of the population is not accustomed to using digital devices and when the phone contact information is readily available. 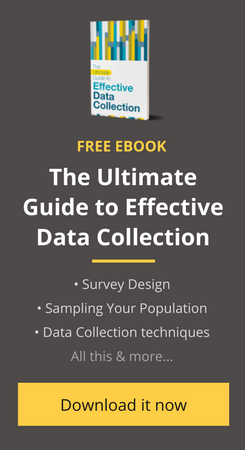 Keeping these factors in mind would go a long way in helping you decide upon the right methodology for data collection. Finding a representative section of the population for your survey is the next challenge that many researchers face. Read on to know more about survey sampling techniques and how you can use them to optimize your resources in the most effective manner. No matter what data you’re collecting, collecting data in the field is always easier with a mobile app. We’ve helped over 200 partners collect over 20 million data points through our mobile data collection app Collect. I found it very useful. Are there some practical couses on this stuff? Nice Article about Data Collection Methods.